OXFORD, Miss. – Susan Grayzel, director of the Sarah Isom Center for Women and Gender Studies for four of the last five years, will soon step down to return to teaching history full time. Grayzel became the Isom Center’s director in 2013 after having served as interim director since 2011. Having been awarded an American Council of Learned Societies Collaborative Fellowship, she was on leave during 2014-2015 and came back to finish up a four-year term. That is up and the time for a new leader is right, she said. Grayzel said she’s proud of the center’s work during her tenure. Leading the center is a rewarding job, and she expects the next director will also find the work fulfilling. “There are not that many opportunities faculty can have to learn from the experience of engaging with something that is academic, but also has programming functions that are interdisciplinary and put you in touch with so many different parts of the campus,” Grayzel said. 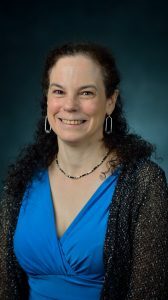 Kirsten Dellinger, chair of the Department of Sociology and Anthropology, is an Isom Center-affiliated faculty member and has served on the center’s advisory board since 1998. She said the university was fortunate to have Grayzel leading the center. Dellinger is tasked with finding a new director and hopes to find someone with some of Grayzel’s qualities and her dedication to lead the center. Grayzel’s accomplishments include increased work on women in science, technology, engineering and mathematics careers, a trained Sexual Assault Nurse Examiner on campus, high-caliber guest lecturers, a mechanism for applying for conference travel funds for affiliated faculty and graduate students, and increased student involvement, Dellinger said. Grayzel said she’s proud of creating the center’s assistant director position, which could be redefined going forward as an associate director job. She credits Theresa Starkey, gender studies instructor, for excelling in the new role for the center. Expanding programming, including helping create two “Rethinking Mass Incarceration in the South” conferences in 2014 and 2016, working with stakeholders on issues of sexual violence and child care and parenting, and also instituting an annual “queer studies” lecture were other major achievements. Expanding the gender studies minor to include an emphasis on sexuality was another important project, and Grayzel said she is proud of the first sets of students in the graduate certificate in gender studies who have completed that program. Susan Grayzel, director of the Sarah Isom Center for Women and Gender Studies, is stepping down to return to teaching history full time. Moving forward, the center is poised to continue offering multidisciplinary programming that includes art and film and music, as well as academics. The center faces some challenges to overcome to raise its profile at Ole Miss. Many students aren’t aware the Isom Center moved to the Lyceum basement a few years ago when renovations at Johnson Commons began, Grayzel said. The center needs a permanent home, she said. Grayzel joined the Department of History in 1996 after receiving her bachelor’s degree from Harvard University and master’s and doctoral degrees from the University of California at Berkeley. She is a scholar of modern Europe, the cultural history of war, and women’s and gender history. She looks forward to returning to the classroom to focus on teaching about modern warfare, gender and sexuality, and 20th-century Europe, and also to working on a book project examining how in the 1920s and 1930s, European countries such as Britain and France imagined and prepared for the prospect of the first war using weapons of mass destruction, namely chemical arms. She’s fulfilling one of her long-term goals this fall by teaching the first UM stand-alone class on the global history of World War I during the 100th anniversary of its fighting in 1914-1918. She and Susan Pedigo, a UM biochemistry professor, also plan to teach a course they developed on “science and war in the 20th century” for the second time. The Isom Center is named for UM faculty member Sarah McGehee Isom, who was also the first female faculty member at a coeducational institution of higher learning in the Southeast. She taught here from 1885 until her death 20 years later. The Sarah Isom Center was established in 1981 with the goal of providing a forum for the study, discussion and advancement of women and gender studies. When UM opened its doors to women in 1882, 11 female students registered for classes. Today, women constitute half the student body. 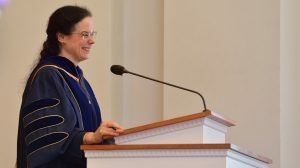 But, the campus, state and nation will continue to confront sexism, racism, homophobia and other problems, and the Isom Center will always have a vital role in the university’s response to those issues, Grayzel said.